…including sucking up… (though I’m guessing most baggage handlers probably HATE luggage tags). If it wasn’t for a friend of mine recommending I look into something like Promotion Choice luggage tags, I don’t think I would have taken the idea of getting brand new tags for my bags as serious as I do now. When you think about it, this is something that makes sense to do, considering how easy it is for anyone’s luggage to go missing. At least this way, you would have done your part. Now, perhaps I should be investing in high-tech luggage tags (that will be a future blog post), but in the meantime, I need something that will work for my carry on bag. When I got a new checked bag, I purchased two inexpensive Travelon tags (2 for $5 with free shipping on Amazon Prime). They are very functional and bright, but I’d like to dedicate them to the two bags that are designated for checking and find something new for my carry-ons. Travelon makes a lot of colorful designs that range from the $3-$9 for two price range. Most are made from PVC and are very durable. 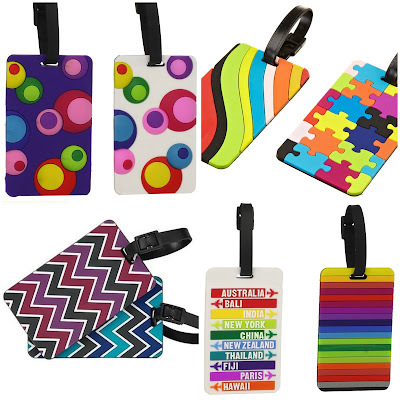 The above Kate Aspen luggage tags are made from flexible rubber and range from $4-$9. 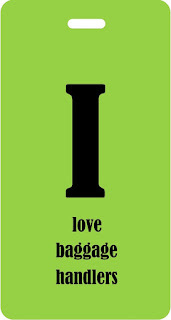 Click the link for more designs, including some that would be great for kids. 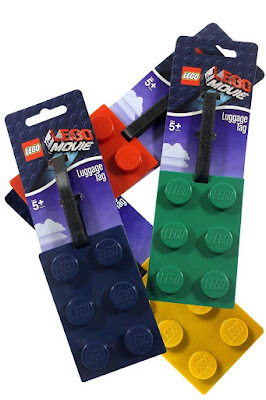 Lego Brick Luggage Tags are great for kids and adults alike (especially if you’re going to Lego Land!). You can find these tags released for the movie online but you may pay anywhere from $8-15 each. 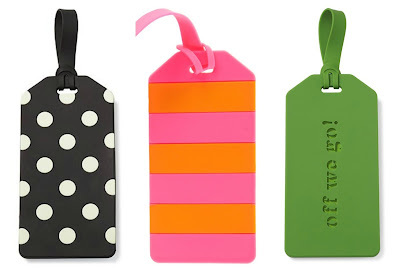 This silicon tag from Kate Spade New York have clean designs but will still be sure to stand out. They are a little more pricey, at $14 each. 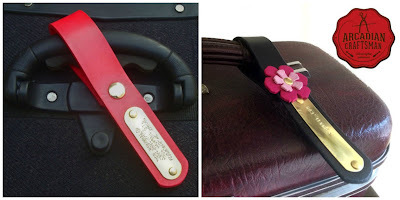 A search for Kess InHouse luggage tags will give you about 3,000 results. It’s a website where artists can upload designs and receive a commission for each piece sold. The luggage tags are in the $18 each range. While a little pricey, you’ll feel better knowing you’re supporting the arts. 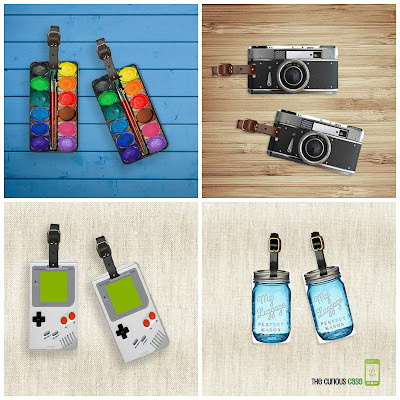 If you’re looking for a bit of nostalgia, or to show off your hobby, check out Curious Case Gifts on Etsy. They carry some of the most unique luggage tags I’ve seen yet. The designs are made to order and most designs are $16 to $18 for two. I love the minimalist look of this leather strap and with the hand stamped brass identification tag from ArcadianCraftsman. 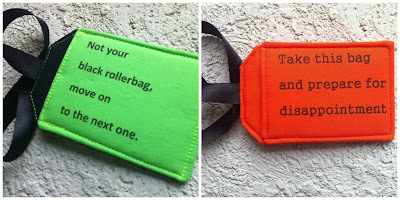 These tags are handmade to order with many different color options. 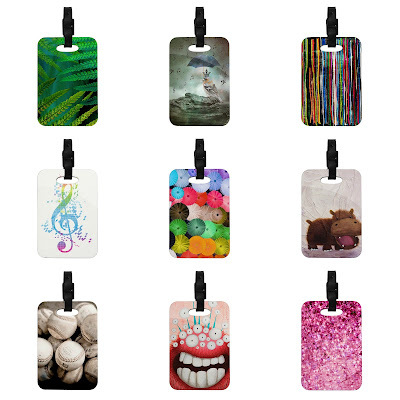 At $25, these tags would also make a good personalized gift. 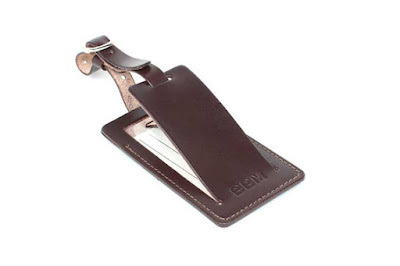 For a more luxurious look, Tagsmith offers a handmade to order leather luggage tag in black, dark brown, or natural color with the option to personalize for $46. A non-personalized version is available for $40. 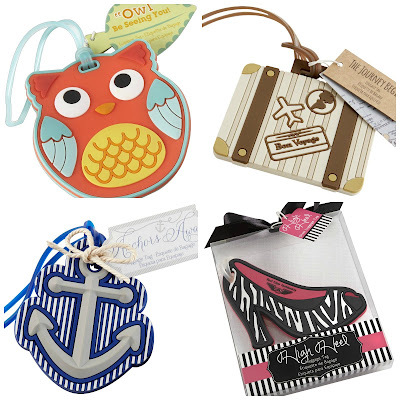 If you’re feeling crafty, grab some self-sealing laminating pouches and download a printable template like this beach luggage tag template from RedefinedMom.com or this travel luggage tag template from BrassandWhatnots.com. 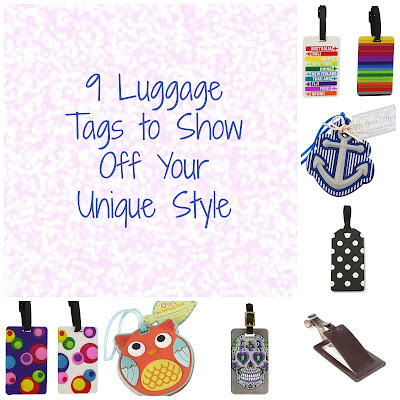 Now, as for what to put on your luggage tag, that’s up to how much of your info you want to share. I’ve heard many people say not to share too much personal info on it, or use a work to P.O. Box for your address. Personally, I have my name, cell phone number, and email address on my tag. I figure that should be good enough to get in contact with me if my airline tag somehow rips off. I should note, that I also have luggage tags on the inside of my checked bags (they are just the airline paper tags) in case my handle ever randomly came off. It may seem overly cautious, but after my bag fell off the bag cart last year in RDU and cracked, I feel like it could happen. Is your bag rocking unique or trendy luggage tag? Let me know by leaving a comment or sending a Tweet! A quick disclosure: some of my links above are affiliate links. If you click and buy something, I make a very very small percentage of the sale and it makes me happy. These are super cute! I need a few new ones… thanks for the inspiration!